Full disclosure: I am not a scientist. I am science literate. But I do not have to be a scientist to vet information given by scientists. Parasitism: an intimate association between organisms of two or more kinds; especially : one in which a parasite obtains benefits from a host which it usually injures. Sophistry: the use of reasoning or arguments that sound correct but are actually false. Recently, I came across an article written by Dr. Danny Faulkner of Answers In Genesis (AiG), titled, A Big Belief. As most folks know, AiG is an organization, headed by Ken Ham, that advocates Young Earth Creationism (YEC), which holds that the earth was created just as the Bible says, 6,000 to 10,000 years ago. The article set me thinking about the why people follow doctrine that, by any reasonable measure, has been shown to be false. Why do people choose faith over objective facts? I understand that most people hold their religious beliefs deep within their being. After all, for billions of people on this interstellar vehicle we call Earth, life is little more than hunger, sickness, sham, and drudgery, especially among the poor. Their religious beliefs give them some comfort and hope for a better world to come, if not on this earth, then in a wonderful life hereafter. My heart goes out to these people of all faiths, and I do not wish to take away hope for a better life. 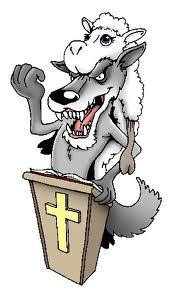 Yet it must be pointed out that blind religious faith (believing a proposition to be true even in the face of overwhelming evidence to the contrary) makes one vulnerable to deception and fraud by charismatic personalities such as Ken Ham, Pat Robertson, Joel Osteen, Hal Lindsey, John Hagee, Creflo Dollar Jr., Joyce Meyer, Benny Hen–the list goes on. These are seemingly devout personalities who prey on the pious for no other reason than their own economic self interest. But, how can one tell the impostor from the genuinely-believing minister? They both speak the same religious language, display the same piety, and point to many of the same verses in the Bible. The first clue is glaringly obvious; their wealth! These predatory charlatans often defend their wealth by what they call Prosperity Theology—the holier one is, the more God rewards him with treasures on Earth. They often put on a glittering, big-stage show, sell many books, and sometimes “lay on hands.” They might point to Job or Abraham as proof of God’s generosity to those of the deepest faith. For the thinking Christian, this should be recognized as sophistry, and sophistry is the means by which these frauds attach themselves to the mind of the unfortunate believer, inject the poison of a misguided sense of self-worth, and then feed on his hope (sucking it out right through his wallet). To avoid these fakes, the thinking Christian must ask himself; What is the real message from the Gospels–the message I am supposed to be following? Then said Jesus unto his disciples, Verily I say unto you, That a rich man shall hardly enter into the kingdom of heaven. Luke 18:22-23 Now when Jesus heard these things, he said unto him, Yet lackest thou one thing: sell all that thou hast, and distribute unto the poor, and thou shalt have treasure in heaven: and come, follow me. And when he heard this, he was very sorrowful: for he was very rich. Now the Christian must ask himself if his minister, and/or anyone else to whom he contributes, follows the aforesaid prescription. If not, then they are frauds. Secondly, to avoid harm, the Christian needs to understand that there are true-believing ministers who are delusional and dangerous. They seek not only your money, but your very being as well. These are folks like Jim Jones, Marshall Applewhite of Heaven’s Gate, and David Koresh of the Branch Davidians. It is unfortunate, but apparently there always will be lost people vulnerable to these passionate, but insane folks, and I can see little that can be done other than through education and psychological help. So, what does all the above have to do with Answers In Genesis, Dr. Faulkner, Ken Ham, and their Creation Museum? Ham’s income at Answers in Genesis is a modest 150,000 per year, but added to that are speaking fees (he’s among the most sought after speakers in fundamentalist circles as well as one of the top spokes persons for the media on the subject of creationism) and book sales numbering in the millions. The man is a millionaire. In his article, Faulkner argues that the Big Bang–the current accepted scientific model of the beginning of the Universe, space, and time–cannot be true because, (1) it is, “fraught with problems,” (2) “different parts of the [Cosmic Microwave Background] CMB have precisely the same temperature.” and that, (3) the model does not agree with the Bible’s account of creation. The first claim (1) amounts to misinformation, and his use of the use of the word, “fraught” is designed to cast doubt on the entire theory before any evidence is given or vetted. It is true that there are anomalies/problems within the Big Bang Theory, but problems are a normal characteristic of scientific research. Suggesting otherwise is misleading. Science is progressive. The more question solved through research, the more questions those solutions raise. Greater knowledge is gained over time, especially by the advent of better technology–new and more finely-tuned instrumentation. This leads us to (2), the claim of temperature uniformity in the CMB. The claim was correct when the CMB was first discovered accidentally, but not now. As technology advanced and finer tuned instruments were developed, minute fluctuations in the temperature were discovered, and the explanation was given. Faulkner should have known this. That the Big Bang theory does not agree with the Bible (3), is an astonishing statement coming from a scientist. It is an atrocity to reason. It is choosing the authority of an ancient, pre-science, unauthenticated story over modern, objective, scientific research. The statement is so far from scientific, that to be spoken by a scientist, it reaches the greatest possible height of absurdity. Still, statement does lay bare very reason for the existence of AiG. It is the primary argument of the creationist–though often unacknowledged–and it is the very reason why creationism is not science. Faulkner should, and probably does, know this. What was left unsaid: By far the most salient fact that Faulkner left out of his article was the primary reason for the Big Bang Theory. In my mind, the way to refute the Big Bang Theory is to show that the physics of the Red Shift, or the Doppler Effect, is false. And the likelihood of that happening is infinitesimally small–it ain’t gonna happen, folks. One last point. Recent advances in theoretical physics are suggesting the possibility that our universe may not be the only universe in existence. Indeed, models now taking shape tend to solve some of the problems within the Big Bang Theory. — Max T. Furr is author of The Empathy Imperative, a philosophical novel exploring the nature of biblical, Divine Justice–as opposed to humanistic justice. Was Descartes wrong and God was a deceiver, after all? What would the world be like if empathy, not self interest, were our primary motivating force?